Instructor User Guide ResourcesHow do I create a citation list? Users can create a citation list for a books, journal articles, manuscripts, newspapers or musical compositions in Resources. There are two methods for creating a citation list. 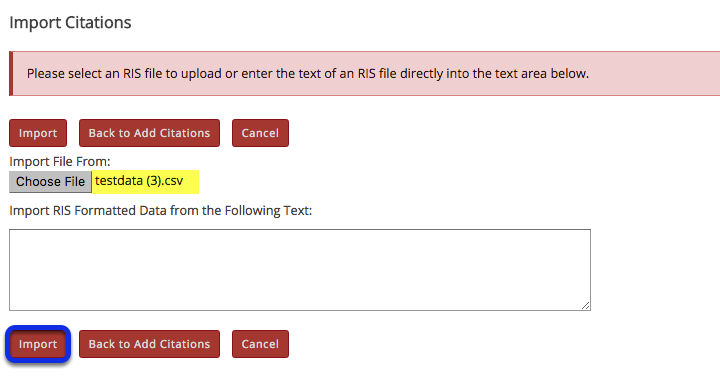 Method 1: Import a file in RIS (Research Information Systems) format. Method 2: Manually create list. Method 1: Import RIS file. Zoom: Method 1: Import RIS file. 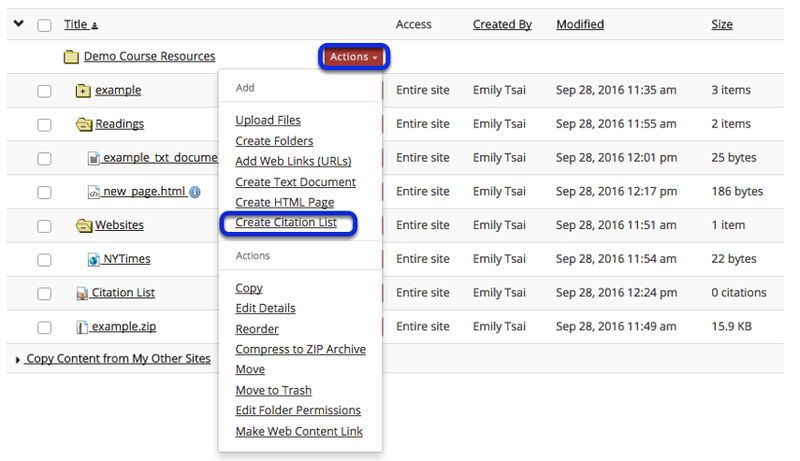 To the right of the folder you want to import the RIS citation list, from the Add drop-down menu, select Create Citation List. 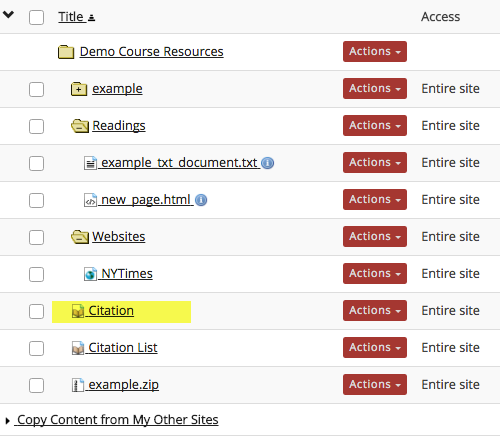 This displays the New Citation List page. Enter a name, then Import. Enter a name for the citation list, then click Import. This displays the Import Citations page. Click Browse to locate and select the .ris file on your computer. Note: The selected .ris filename will appear next to the Browse button. 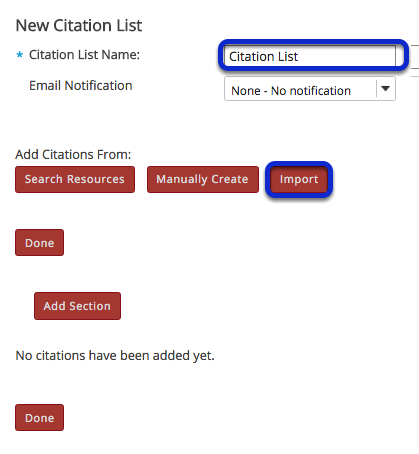 View citation list in Resources. Zoom: View citation list in Resources. The citation list is located in the selected folder. Click on the citation list name. Zoom: Click on the citation list name. 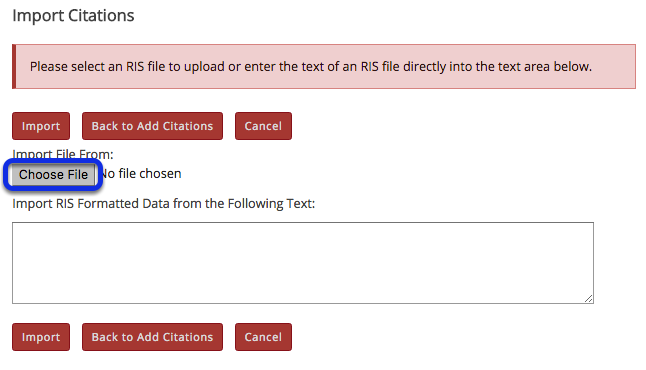 Clicking on the list name will open the item and display the list of citations. 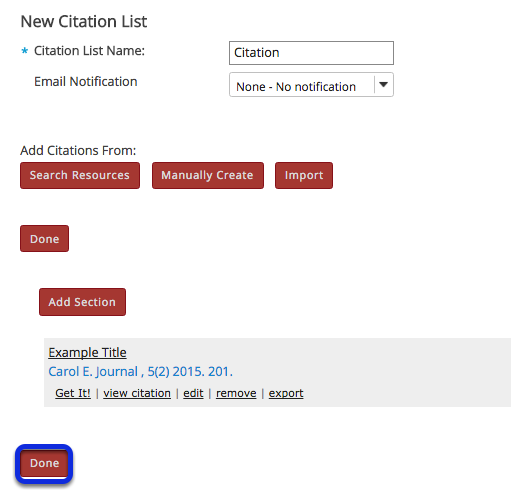 Method 2: Manually create citation list. Zoom: Method 2: Manually create citation list. 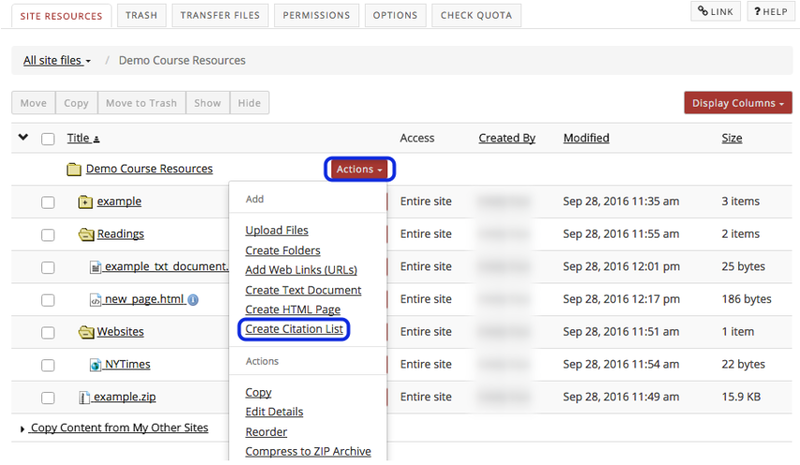 To the right of the folder where you want to create the citation list, from the Actions drop-down menu, select Create Citation List. 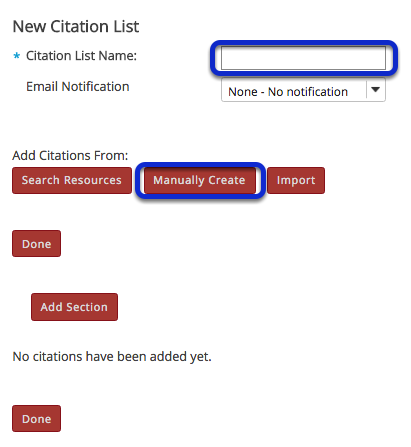 Enter a name for the citation list, then click Manually Create. Enter citation information, then Save. Manually enter the citation information, then click Save Citation. 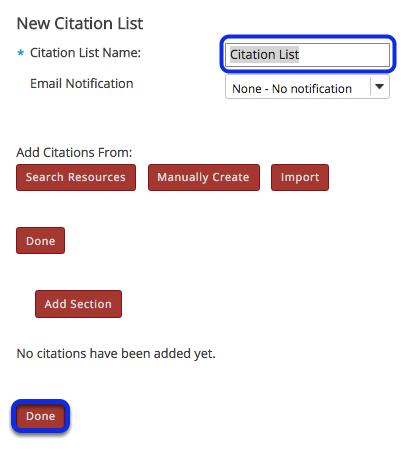 This returns the display to the New Citation List page with a summary of the citation information. You may add more citations if needed. When finished, click Done. The citation is listed in the selected folder. 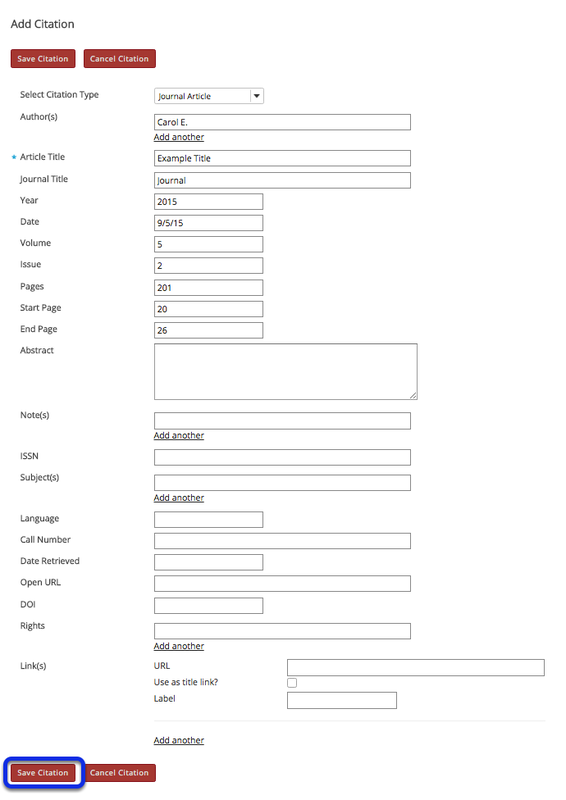 Prev: How do I create an HTML page?